Ukrainian broadcaster NTU have been in chaos lately. As a result of their ongoing issues, there have been some consequences, some minor and some major. All of these are now starting to stack against Ukraine, with time running out can they work through them? There have been a number of problems since Ukraine won the contest back in May. From many delays with the host city announcement to budget concerns. The biggest unexpected problem was the resignation/mutual consent departure by Zurab Alasania. It is as a direct result of all of these, that the consequences are starting to arise. Some of them not so serious, some of them extremely serious. Today, Zurab Alasania was officially dismissed from his job. The chairman of Television and Radio Broadcasting finalised the dismissal. Earlier reports stated that Alasania resigned. According to confirmation from the first Deputy, he was dismissed by mutual consent. This can mean a number of things, in most cases it means an employer mutually agrees to terminate your contract. Alasania is still chairman of the reforms that are going to be taking place, as a result of what has happened recently. It is his departure which made the government decide that they need urgent reforms. The government have officially taken over the organisation of the 2017 Eurovision Song Contest. As well as that, they are administering their side of the budget carefully, and at regular intervals. Sofia Rol, the Ukraine entry to the 2016 Junior Eurovision in Valletta, has stated they are short of their money target. They needed a total of 500,000 UAH and at the moment they only have 50,000 UAH. Sofia confirmed her participation is in danger because of this. The final sum of money included participation fees. International press are starting to doubt Ukraine and their capabilities, despite hosting three previous Junior editions and the main contest in 2005. So far the European Broadcasting Union remain silent about the issues. 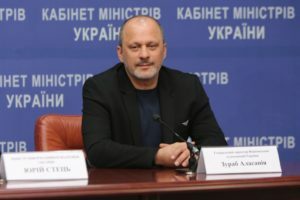 The only thing confirmed as a result of the chaos, is that the first deputy Director General, Oleksandr Kharebin, has taken over at NTU, also the government have taken over the organisational side of matters. The next disaster on the radar will be the withdrawal of Sofia Rol from The Junior Eurovision Song Contest in Valletta. Below you can see the reason why Ukraine is to host the 2017 Eurovision Song Contest: Jamala performing her 1944 entry which went on to winning the contest in Stockholm, Sweden in May this year.